Back in 2009, Charlie Jane Anders published a nifty blogpost on io9 in the midst of the BSG finale, last of the LOST episodes, and after the aftermath of Heroes, about how NOT to put religion in your science fiction. Things she was tired of seeing, but also things she believed you might also be tired of seeing. The blog post still feels relevant, though you can argue her points. Certainly it pertains to Tess 18’s theme of faith in science fiction and fantasy–and challenges us to come up with ways to avoid putting faith in science fiction badly. We’ve mentioned a few of them ourselves here. But maybe we can post a bigger response. 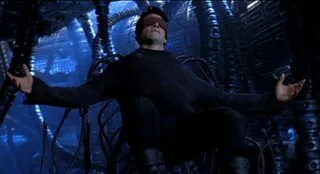 Try putting one of your “deadly sins” of putting religion in science fiction (or fantasy) in the comments section of our blog here–and let’s see if we can come up with our own version of this list. Jerome writes science fiction/ fantasy and LGBT fiction and has been published in many magazines and journals including The Magazine of Fantasy and Science Fiction, Lightspeed, Fantasy, Tor.com, Strange Horizons, Geist, Geez, Rock and Sling, and The Rio Grande Review. His first collection, The Angels of Our Better Beasts, was published in 2016 by ChiZine Publications and was shortlisted for the Sunburst Award. He was co-editor of four anthologies: Inhuman, Wrestling with Gods: Tesseracts 18 from EDGE Science Fiction and Fantasy Publishing, Imaginarium 4 from ChiZine Publications, and the forthcoming Living Metal: Heavy Metal Music Scenes Around the World from Intellect Press. Jerome has been a trolley conductor, radio journalist living in a subarctic research station, a vaudevillian, and a tour guide to Theodore Roosevelt's home. He is currently a portrait artist and illustrator. He lived for 10 years in the Yukon Territory, but now lives in Dayton, OH. Not sure if I can think of a specific bad example (perhaps some episodes of Star Trek: TNG), but one thing that bugs me is when religion is presented as inherently outdated or irrelevant. That is, if the “religious” people or culture are merely clinging to old ways for the sake of… being backward. I think any portrayal of religion as merely that ignores the fact that faith has a huge impact on people’s daily lives and is constantly remoulded in every generation to be relevant to what the believers need it to do. If they need to cling to some former glory days, that is one thing; but that’s not necessarily the default. I like the handling of witchcraft and sorcery in Steven Brust’s Jhereg books. Witchcraft was practised by Easterners whereas the reigning Dragaerans, with their connection to the Imperial Orb, were enabled to practise sorcery and disdained to even learn about witchcraft. 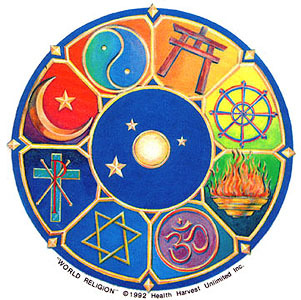 Neither belief or practice was portrayed as the One True Way, and in the context of the fantasy world he created, they both worked — but they were very much tied to the culture and self-identification of the practitioners. I agree, David. Religious people as automatically backwards folks who can’t think is a trope that needs to end. Yes, there are those examples—but there are many many people who are intelligent thinkers, even progressive thinkers. I’ll have to check out Brust’s books. Get your Kindle edition NOW! Click on the image! 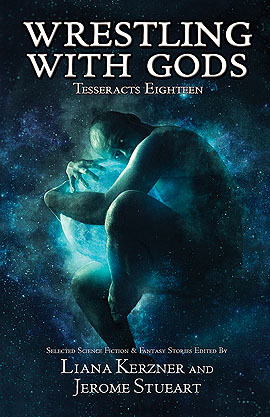 Tesseracts 18:Wrestling With Gods is published by Edge Science Fiction and Fantasy Publishing. All Tesseracts (1-18, Q) published by EDGE. Was Arjun of the Mahabharata gay, and would that matter?